Last Christmas, and for the first time ever, I received three copies of the same business book: ‘The Rise of the Robots’ by Martin Ford. I have never even received two identical presents before, let alone three! So I decided to give two copies to close friends via Facebook… and they were snapped up in seconds! But that’s hardly surprising. Even the most casual observer of the tech market cannot fail to have noticed the coverage this whole subject is receiving. Nor can you miss the groundswell of concern it is fomenting. In November 2015, the Bank of England’s Chief Economist – Andy Haldane – went public when he warned that up to 15 million British jobs are in danger of being lost to a new age of robots. Almost half of all employed adults in the UK are at risk from the ‘third machine age’. What are we actually talking about here: robots as depicted in Sci-Fi films or software that automates business processes? Well, unsurprisingly, I want to focus on business process automation. Unfortunately, there is so much emotive baggage associated with the word ‘robot’ that it’s often difficult to arrive at any sensible, reasoned conclusions. So let’s swap ‘robot’ for a less contentious phrase: Robotic Process Automation (RPA). RPA, like so much of technology, is a new phrase for a pretty old concept. What is new, though, is just how far and how quickly this concept has developed in the last few years… and, I strongly believe, developed for the better. 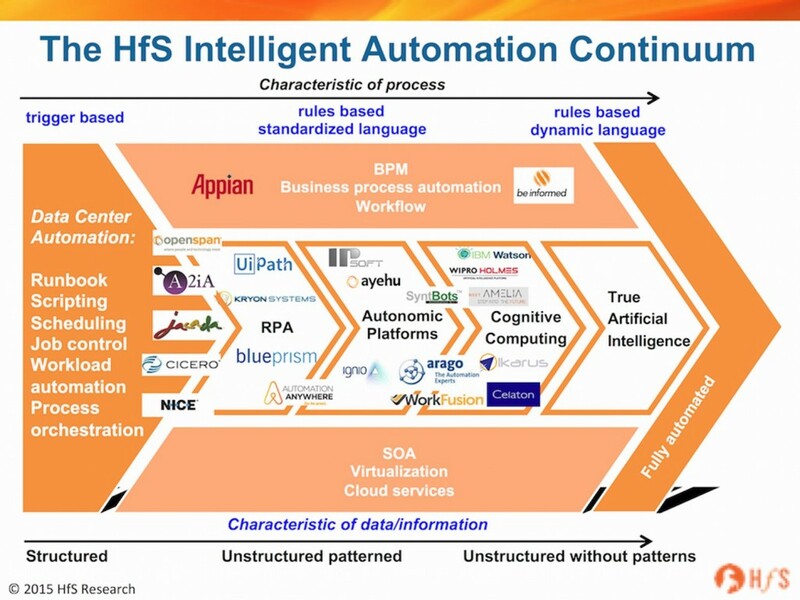 The much-respected analysts HfS have coined the notion of ‘Intelligent Automation Platforms’ (IAPs). And to help explain IAPs, they have created a very useful chart which shows how these tools have developed over time and how they might evolve in the coming years as we travel towards true AI. Traditional approaches to automating business processes have followed the usual workflow paradigms. They mimic the manual paper chase – embedding all sorts of business rules and conditions into flowcharts, and, ultimately, into software applications. The big problem with these traditional methodologies is that they struggle to handle exceptions to the norm. And, because they are unable to cope with sudden change, they often require workflows to be highly structured and predictable…a laudable fantasy but a laughable reality! What’s more, proving that these tools have covered all possible permutations can prove virtually impossible. Indeed, early tools were not even good at handling very high business volumes. So which robotic tool should you adopt? At this point, it is worth clarifying the different robotic tools and AI systems that are available. In truth, the choice is pretty wide and ranges from IBM’s Deep Blue (created to deliver extreme performance in one competence: Chess) through to tools that purely automate human interaction over existing systems. Capturing business rules in a business domain language; not a programming one. This aligns the application to the business at speeds close to real time. Dynamically reacting to different types of work and determining the exact processing route at execution time. This enables far higher levels of automation than traditional workflow-based systems. Fine-grained reasoning and reporting – this enormously enhances traceability and it delivers much improved compliance. Interestingly, we represent two companies that have created rules-based tools – in fact, one of these companies is featured on the right-hand side of the diagram. Developed originally to represent the semantics of (Dutch) Law, it became naturally capable of capturing the semantics (rules) of businesses… especially the many businesses driven by (legal) regulations and codes of conduct. The Robo Agent, or inference engine, then routes the cases through a network of stages – human or automated – to process the case to completion. The tool dynamically manages the journey for customers and case-workers alike. This allows progress to be made along the journey regardless of whether all of the required data has been supplied. It never makes a wrong turning and never, ever breaks any rules. And this is only possible because each route is dynamically created so massive volumes and permutations are capable of being handled simultaneously. This platform has been continuously developed over a ten-year period. It is now a fully-fledged business knowledge base as well as a robust and scalable process automation engine. It has also been recognised by analysts as an industry leader and adopted by major government and enterprise clients. Although created well ahead of its time, this outlier in the traditional BPM category is now widely regarded as a leader in the RPA domain. For a start, it devalues all of my training and experience as a senior IT consultant. RPA solutions really must justify their existence – how else can you keep track of ROI? A reduction in the time taken to implement legislation – from 9 months to just 2 days! A really significant reduction in administrative staff – cutting numbers from quite a few hundred to just a few dozen staff. But the biggest benefit of all, is the reduction in costly, embarrassing and often dangerous mistakes. RPA is no longer sci-fi but real-life. Platforms, such as the one described above, can handle scale and complexity without compromise. This enables and empowers businesses to reach new levels of automation without any loss of competitive agility. The robots really have risen… for all the right reasons.